Does our biological clock keep cancer at bay? Our body has an internal biological or “circadian” clock, which cycles daily and is synchronized with solar time. New research done in mice suggests that it can help suppress cancer. The study, publishing 7 December in the open access journal PLOS Biology by Dr Angela Relógio from the Charité-Medical University of Berlin, Germany and colleagues, hypothesized that given the range of molecular time-dependent processes that it regulates, including metabolism, DNA repair, and the cell cycle, the circadian clock has the potential to act as a tumour suppressor. 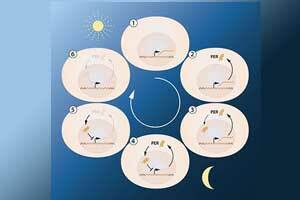 The circadian clock runs in sync with environmental light-dark cycles and helps to orchestrate metabolic and behavioral patterns such as daily cycles of rest and activity. Many diseases including cancer can disrupt the clock, causing it to run amok. When cells in our body multiply, however, they follow a different schedule known as the cell cycle, in which two daughter cells are produced by cell division at the end of the cycle. Many cancers involve a dysfunctional or hyperactive cell cycle, which enables the tumor cells to multiply uncontrollably. The research team found that when they perturbed a protein called RAS, which is inappropriately activated in about a quarter of all human tumors, and two proteins called INK4a and ARF, which can suppress cancer, they discovered a cross-talk between the circadian clock and the cell cycle. They show that RAS, which is known to control the cell cycle, also controls the circadian rhythms, and exerts its effect on the circadian clock via INK4A and ARF. Their work highlights the important role of the circadian clock as the modulator of cell fate decisions and further reinforces the function of the circadian clock as a cancer-preventing mechanism. The findings of Relógio and colleagues reveal that a new layer of complexity – internal time -may be relevant for cancer treatment, and chime with recent studies that propose the use of chronotherapy, in which sleeping and waking times are adjusted in an attempt to reset the patient’s biological clock. In the light of the new findings here described and the chronotherapy studies published so far, we might need to rethink cancer treatment, by including the internal time factor, to achieve optimal therapeutic effects.